John Malone is digging his fingers deep into the mini-major movie studio. Too deep for some investors, it seems. What: Shares of Lions Gate Entertainment (NYSE:LGF-A) fell 12.9% in November, according to data from S&P Capital IQ. There was nothing smooth about this plunge, with plenty of significant news pulling the stock in every direction. 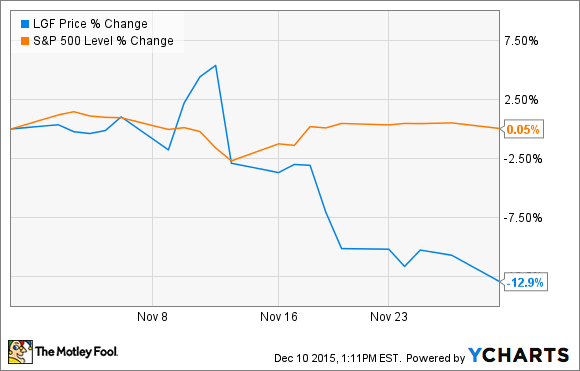 So what: At first, November was looking good for Lionsgate investors. Despite missing Wall Street's estimates in a disappointing second-quarter report, shares rose the next day because media mogul John Malone was buying a 7% stake in the company. Through his cable and content operators Liberty Global (NASDAQ:LBTYA) and Discovery Communications (NASDAQ:DISCA), Malone grabbed 10 million Lionsgate shares. Then, the company announced a $200 million investment in reality show producer Pilgrim Studios, good for a 50% stake in that company. At the same time, a large bank launched a secondary offering of Lionsgate shares, adding 3.4 million stubs to the free float but contributing nothing to Lionsgate's coffers. This move was part and parcel of John Malone's investment, helping Discovery and Liberty Global secure enough shares at the desired price. Lionsgate investors didn't expect this 2% dilution, nor did they appreciate it. Share prices plunged 7% the next day and 14% by the end of that week. Now what: At this point, it's hard to tell whether John Malone's intense interest is good or bad for Lionsgate and its investors. The media maven sent three new representatives into Lionsgate's boardroom as part of his big investment. I say "new" because Malone himself grabbed a seat in Lionsgate's boardroom back in February. Nobody knows exactly what Malone is planning to do with Lionsgate, but he currently controls four of the company's 14 board positions. This gives him a real say in where the company goes next. Just a few more slots, and he'd be able to do a quiet takeover that doesn't quite qualify as "hostile." Katniss might have a new boss soon. For now, Lionsgate investors seem more nervous than excited about that idea.